A stress test is primarily used to identify coronary artery disease. It requires patients to exercise on a treadmill or exercise bicycle while their heart rate, blood pressure, electrocardiogram (ECG), and symptoms are monitored. The body requires more oxygen during exercise than at rest. To deliver more oxygen during exercise, the heart has to pump more oxygen-rich blood. Because of the increased stress on the heart, exercise can reveal coronary problems that are not apparent when the body is at rest. This is why the stress test, though not perfect, remains the best initial noninvasive practical coronary test. The stress test is particularly useful for detecting ischemia (inadequate supply of blood to the heart muscle) caused by blocked coronary arteries. Less commonly, it is used to determine safe levels of exercise in people with existing coronary artery disease. A technician affixes electrodes to the patient's chest, using adhesive patches with a special gel that conducts electrical impulses. Typically, electrodes are placed under each collarbone and each bottom rib, and six electrodes are placed across the chest in a rough outline of the heart. Wires from the electrodes are connected to an ECG, which records the electrical activity picked up by the electrodes. The technician runs resting ECG tests while the patient is lying down, then standing up, and then breathing heavily for half a minute. 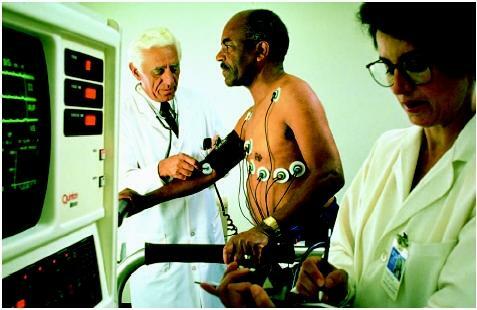 These baseline tests can later be compared with the ECG tests performed while the patient is exercising. The patient's blood pressure is taken and the blood pressure cuff is left in place so that blood pressure can be measured periodically throughout the test. The patient begins riding a stationary bicycle or walking on a treadmill. Gradually the intensity of the exercise is increased. For example, if the patient is walking on a treadmill, then the speed of the treadmill increases and the treadmill is tilted upward to simulate an incline. If the patient is on an exercise bicycle, then the resistance or "drag" is gradually increased. The patient continues exercising at increasing intensity until reaching the target heart rate (generally set at a minimum of 85% of the maximal predicted heart rate based on the patient's age) or experiences severe fatigue, dizziness, or chest pain. During the test, the patient's heart rate, ECG, and blood pressure are monitored. Sometimes such other tests, as echocardiography or thallium scanning, are used in conjunction with the exercise stress test. For instance, recent studies suggest that women have a high rate of false negatives (results showing no problem when one exists) and false positives (results showing a problem when one does not exist) with the stress test. They may benefit from another test, such as exercise echocardiography. People who are unable to exercise may be injected with such drugs, as adenosine, which mimic the effects of exercise on the heart, and then given a thallium scan. The thallium scan or echocardiogram are particularly useful when the patient's resting ECG is abnormal. In such cases, interpretation of exercise-induced ECG abnormalities is difficult. Patients are usually instructed not to eat or smoke for several hours before the test. They should be advised to inform the physician about any medications they are taking, and to wear comfortable sneakers and exercise clothing. Photograph by Mug Shots. The Stock Market. Reproduced by permission. and there are no signs of distress, the patient may return to his or her normal daily activities. There is a very slight risk of myocardial infarction (a heart attack) from the exercise, as well as cardiac arrhythmia (irregular heart beats), angina, or cardiac arrest (about one in 100,000). The exercise stress test carries a very slight risk (one in 100,000) of causing a heart attack. For this reason, exercise stress tests should be attended by health care professionals with immediate access to defibrillators and other emergency equipment. A normal result of an exercise stress test shows normal electrocardiogram tracings and heart rate, blood pressure within the normal range, and no angina, unusual dizziness, or shortness of breath. A number of abnormalities may appear on an exercise stress test. Examples of exercise-induced ECG abnormalities are ST segment depression or heart rhythm disturbances. These ECG abnormalities may indicate deprivation of blood to the heart muscle (ischemia) caused by narrowed or blocked coronary arteries. Stress test abnormalities generally require further diagnostic evaluation and therapy. Patients must be well prepared for a stress test. They should not only know the purpose of the test, but also signs and symptoms that indicate the test should be stopped. Physicians, nurses, and ECG technicians can ensure patient safety by encouraging them to immediately communicate discomfort at any time during the stress test. Ahya, Shubhada N., Kellie Flood, and Subramanian Paranjothi. The Washington Manual of Medical Therapeutics, 30th edition. Philadelphia: Lippincott Williams & Wilkins, 2001, pp. 96–100. American Heart Association. 7272 Greenville Avenue, Dallas, TX 75231. (214) 373-6300. http://www.amhrt.org . National Heart, Lung, and Blood Institute. Information Center. PO Box 30105, Bethesda, MD 20824-0105. (301) 951-3260. http://www.nhlbi.nih.gov . Barbara Wexler Lee A. Shratter, M.D. This article is so simple, concise, contain useful information for undergraduate nurses. Also it contain outline "def., preparation, description,.....", so will not allow the reader to guess or put outline or title for each paragraph. thank you. FORWARD TO ME CONCERNING THIS. I am 70 years old. About 5 years ago I had a CT scan that I requested myself. Everything on the CT was good except I had a calcium score of 1492. Since then I have had nuclear stress test that was good, another ct scan that scored 1400 calcium score. I did some research on the web and found that there are a lot of false positive scores on the ct scan. Then I requested a cauterization and there was no blockage. I exercise about 7 to 9 hours per week usually 1 hour on eliptical machine 4.6 miles and 30 minutes weights. I went for a check up and my Dr. decided I might do a stress test. I did not get any guidance. I drank a large coffee about 30 minutes before the test. I drank a fair amount of scotch the night before and also smoked a little grass. I did not sleep well so I took two melitonin and two asprin. I had a little hangover during the test. After about 3 minutes I was at 120 and when we increased again I jumped instantly to 220. We slowed back down and my rate fell back instantly to 120. My Dr. wants to do another cautherization but I think I need to take this test over and prepare accordingly, What do you think and what is your opinion of the false positive ct scans? I cannot seem to find any comments from people on the web who have experienced the EXTREME pain that I did during a drug induced stress test. There was little information given to me prior to the testing. Of course, I did have the nuclear readings before and after. However, I experienced pain so severe that I still have ribs hurting terribly two days later. I began to hurt almost immediately in the jaw, then that stopped and the pain was concentrated under my rib cage. It was simply torture. Felt like the mafia had taken a rubber mallet to me and managed not to break the ribs! I truly can say I have NEVER experienced such sustained intense pain that had me screaming and tears were uncontrollable. I suffer from chronic pain and have a high pain threshold, but this is the kind of thing you really would expect in a torture chamber. I don't know how the two people were able to be in the same room while I was screaming in such pain. When it was over I cried uncontrollably for 45 minutes. Both technicians left the room immediately after the test and a young x-ray technician was sent in to "baby-sit" me. I have since realized I could have gone into cardiac arrest and the young woman would not have been able to handle the situation. I will never have another stress test at this hospital. When rolling me back to the room, the very nice young technician commented, "Well, you made it through it." Maybe so, but today (2 days later)I have an infection and a fever of 101 that I cannot get to break. I will be seeing the doctor (my internist) tomorrow morning about that. After thinking about it, the only doctors I saw in the hospital, even though I was on the cardiac unit, was the emergency room doctor when I came in and my internist who came in prior to the testing. Has anyone EVER heard of a situation like this? I now believe the hospital that is ranked in the top 100 in the nation has incompetent practices, regardless of the up-to-date equipment and showy renovations. I AM A NON MEDICAL LAY PERSON USING MY BEST MENTAL ABILITY TO THINK THIS TYPE OF PROCEDURE THROUGH --- IF A PERSON HAS NEVER HAD HEART DIFFICULTIES AND IT DOES NOT RUN IN THEIR FAMILY WHY SHOULD HE SEE A HEART DOCTOR. SEEING THIS TYPE OF DOCTOR IS LIKE SEEING ANY OTHER DOCTOR THAT CANNOT DETERMINE WHAT IS WRONG WITH A PATIENT WITHOUT GOING INSIDE A PERSON'S BODY AND WHAT IS THIS PROCEDURE CAUSES ADDITONAL PHYSICAL HARM. REALLY NOW, THE PATIENT IS DEPENDED UPON THIS TYPE OF SPECIALITY --- HAVING TAKEN ADDITIONAL 25 HOURS --- TO MAKE JUDGEMENTS ABOUT A PERSONS ILLNESS THAT CAUSE THE OUTCOME TO BE SUCH THAT THEY WILL HAVE A LIFE LONG RELATION WITH SOMEONE WHO WILL ALLOW THEM TO MAKE LOADS OF MONEY FROM UNNECESSARY PROCEDURES. I AM OVERWEIGHT, EAT ALL THE THINGS THAT THEY SAY IS NOT GOOD FOR YOU. HAVE NEVER HAD DIFFICULTY WITH MY HEART AND DO NOT HAVE A FAMILY HISTORY OF HEART PROBLEMS. WHY IN HELL WOULD I NEED A DAMNED STRESS TEST??? I had a medically induced stress test on Friday at Cooper hospital with the radioactive meds. I couldn't run due to left bundle branch block. Even with the reversal medicine for symptoms, I've still been violently nauseated to this minute (over 2 days now) can you have an allergic reaction to the stress inducing medications and the radioactive dye? My husband had a stress test and the doctor called and said his heart beat didn't go as high as it should have during the test. Now he is going to a cardiologist. He is 77. To answer Belva's question. I too had the drug induced stress test and I have previously been diagnosed with advanced microvascular cardiac disease after a second angioplasty with a second PCI for 100% blockage. First stent on circumflex artery, second stent on my Ramus artery which was a collateral artery that my heart created. I take 4 different medications for severe angina which I have daily. Within 30 seconds of being injected with the drug to increase my heart rate my chest started burning like it was on fire and this pain radiated to my jaw. I became hysterical and started screaming and crying that it was just like my heart attack in April of this year. The pain was unbelievable and I was very sure they had just induced a second heart attack but this time I would code. I am a bachelor educated registered nurse so I do understand the reason for the test to help my cardiologist manage my chronic angina. Had I known this was going to happen to me I would have never shown up for the test. They would not let me take the regular treadmill stress test because I had experienced chest pain in the past 24 hours. I had to tell them, per their policy, I would never be eligible for a regular treadmill stress test because I have suffered with angina everyday since my heart attack in April. I have a very, very good cardiologist in Seattle and I drive 6 hours one way to go see her. My cardiologist assured me that I would not have another heart attack just because I have chronic angina, but I am not sure I agree with her on that point. I have done a lot of research on my diagnosis and it is very difficult to obtain any prognosis. I am unable to work and have been forced to apply for social security disability at age 51. I did get the medication to reverse the effects of the medication given to mimic stress on my heart and my chest is still hurting 4 days later. I have been using a lot more SL nitro than usual and really felt like a large, strong man has punched me very hard in the chest several times. I pray the pain of this test waxes and wanes overtime. I was also given 2 SL nitro stats within a minute of receiving the antidote. I will NEVER subject myself to this test again. It was the worse pain I have ever experienced in my life and I have a very high tolerance for pain. If my angina does not subside I will be forced to call and report this to my cardiologist. It makes me feel like it stressed my heart to the point of damage, but the ECG's are all normal. I would not recommend this test to anyone, based on my experience. I had this test a short while ago and found it very painful as it went through my heart and everything went dark as if I was going to pass out..the pain then moved to my tummy so I suppose aorta where it hurt like hell again ..even felt it go down the first big veins in my thighs then it dissipated.. still awaiting result...do I assume with the heart pain something is wrong?? My eyes were fluttering and they were calling my name. I don't remember much for a few minutes. I have a pre- existing disability. Plus I had surgery on the base of my skull. What does the tightness in my chest mean. I don't know if I can handle yet another procedure. Today I had a stress test done. I have no previous cardio history. During the test the pain was so excruciating I thought I would have to stop the procedure. Other than labor pain, I have never had a pain so intense. No one seemed concerned about the amount of pain I was in. I began to heave and feel like I would vomit, but there was nothing in my stomach. The drug used was dobutamine. I am trying to get all the info I can and was interested to hear others has this experience. My test results came out fine. I just was concerned about the intensity of pain. I had a chemically induced stress test on Friday, I became very dizzy with the first injection, worse with the 2nd. Difficulty walking to my car...now Sunday and still having dizziness. Is this normal? my husband had a massive heart attack 3 weeks ago where he had some kidney failure too. Is it safe to have a nuclear stress test so soon after this heart attack with his kidney and all? I had two past anxiety attacks in the past three years that I went to the ER for, stayed in cardiac unit, nuclear stress tests, the whole 9 yards. All tests were found to be normal. The latest visit was last December after my father in law passed away. Three weeks ago, my mother passed away and I'm under a lot of stress at work, I have began experiencing the same symptoms and if course it scares me because I do have heart disease that runs in my family. I've been on a low dose of anti anxiety medication for a while and just don't want to go running big back to ER with another anxiety issue. Worrying about this makes the anxiety worse of course. What are the chances of having blockage now that wasn't there 10 months ago? If it's going to happen, it has to start at some point, right? I'm 49, female and in beginning stages of menapause. I had a stress test done today. Shortly after the chemicals were given I began to get faint and almost passed out. The stopped the test and had me drink coffee to neutralize the chemicals. I also have exercise induced asthma. Can you tell me why this happens? I had a stress test in AZ that at the first signs of problems they stopped the test. Last year I was in MI and the heart dr. I had there wanted me to go through another one. I really didn't want to, but asked if they would also stop the test at the first sign of problems, and was assured they would. It was so horrible, with so much pain, I begged them to stop the test. They didn't. To this day I still am having more breathing difficulty (I do have COPD/Emphysema at 25% lung power & still fighting for a disability since 2010). I was told, and keep getting told, that the COPD/Emphysema is the culprit. Problem is that the Pulmonary Function Tests still have me at 25%. I have a very hard time believing that it's the COPD/Emphysema. I also have various other problems, since the stress test, not related to my breathing problems. I would not reccomend this test to my worst enemy!! five hours later. It is unusually fast according to my blood pressure machine. Has anyone else experienced fast pulse rate and if so, how long does it last? Two days since a med induced stress test and I am violently nauseous!!! Called cardi no reply. I tolerate nausea not well!! I too had excruciating pain during both chemical stress tests, had false positives on both due to breast size, and needed a cath test to make sure no blockage. There was none. Now the doc want to do another because my ekg's are abnormal due to breast size. What's the damn point? After the last test, that doc asked if I wanted to participate in a study that would help patients who have false positives but i refused because it meant having the chemical stress test several times. The medicine to be used this time is called Lexiscan. Does anyone know if this is a new drug that won't cause the horrible pain? I don't want to go through this but need medical clearance to have my hip replaced. Which, of course, is why I can't do the treadmill test because I can't walk well, much less on a treadmill. Omg, I had the non-stress test for my heart today (10-27-17) and I would rather walked on the treadmill, even with my bad knee. As soon as the technician injected with the chemical, I almost passed out and I could taste this awful metal taste in my mouth and nose. Then came the huge headache. My heart was racing fast, then I went into a complete sweat. My hearing went away for a moment too, since I though I was going to pass out. The technicians were saying, can you pronounce your full name, can you pronounce your full name? I was out of it. Had I known this was going to happen, I would of opted out. I'm still shaking and trembling with my body, my heart is faster beat and drank some diet soda (to decrease the headache pain). I should of used Uber to take me there and back. Driving back home was scary since I didn't feel in control or centered. To add insult to injury, my "heart" is hurting and it feels like someone squeezed my heart hard. I hope this goes away soon. For anyone else reading this - - - be careful and use common sense. Here's my experience - I went in on Monday for the stress test. I wasn't even asked about walking on the treadmill (??! ), but I was going to opt out anyway because of recent foot pain I've been having. I need to find out exactly what (radioactive) chemical they injected, but I felt the effects immediately and I believe 2 days later I am STILL having side effects. As others have mentioned, I felt A LOT of unbearable pressure in my jaw & head area, then chest pressure (squeezing). I don't know if this had anything to do with my blood pressure being high (it always is at the doctors office), and my pulse only got up to 120 (?). After the test, to counter the side effects, I was given some kind of (caffeine tea derivative?) injected in my vein. The side effects went away, or so I thought. Both last night and tonight I am feeling nauseous and full hours after eating, with no appetite. I've been drinking a lot of water to try & flush the chemicals out. If I had known about the side effects, I definitely would have opted for the treadmill!